Calgary & Banff - Blog from Banff, Alberta | Dreaming of a White Christmas! As it was only about a 1.5hr drive to Banff, we decided to have a look around Calgary this morning. It was really nice to only wear one layer and sneakers rather than boots. The sun was shining and the sky was blue. 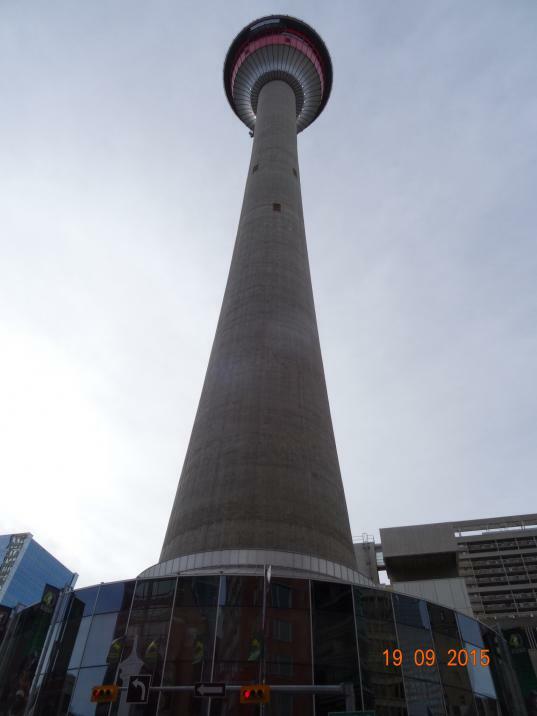 We went to the Calgary Tower which stands over 900m tall. It was a clear day and we could see for miles. The Canadian Rockies on one side were tall and sharp with a dusting of snow. We had an audio tour so we could just tap on a picture of a building or direction and it told us about it. Calgary is famous for the Calgary Stampede which is held in July. That would be great to see. Out to one side in the distance we could see the looming tower that was used for the ski jump, luge and toboggan when Calgary held the winter games. We got a much closer look at the Olympic park as we drove past it on the way to Banff. It was a shame we didn't have time to visit. We spent nearly 2hrs in the Tower and then walked down a block to Stephen Avenue which is a historical street now closed to traffic. It it full of restaurants, shops and lovely old buildings. There was also lots of sculptures along the street and plenty of buskers. My favourite was a cowboy playing a banjo! We walked up and down for a while before stopping at a pub for lunch. It was good to be able to sit outside! After lunch we headed for Banff. It was an easy drive with a spectacular view of the Rockies. Some were snow capped and others weren't. We also passed lots of waterways, most of them very clear and running over rocks. We arrived in Banff and found it was full of tourists. We found our hotel way up above the town. They gave us passes to catch the bus as often as we want to which is really convenient. It can be hard to park in the town. We caught the bus downtown tonight and spent some time looking in the shops before stopping for dinner. It was much cooler than Calgary. We are back in coats, boots and beanies. Yesterday was a very long day so we need an early night tonight.